What's Up TV production training kicked off at MAMA Youth once again. 24 young people have gone through a rigorous recruitment process and are now ready to be thrown into the deep end while they produce season 14 of What's Up TV for Sky 1. 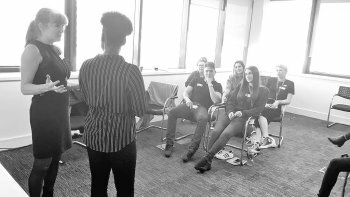 But before all of that, they all meet Steph Coleman, our communication guru, and some great industry professionals passing on their knowledge. Many thanks to the BBC Academy for all the amazing sessions. Thanks to Steve Evanson for delivering production research training and to Mike Wright, Simon Kidd & Dan Donnelly for showing the trainees the self-shooting ropes; thanks to Alex Dalton & Linda Cockburn for the story telling & pitching sessions. 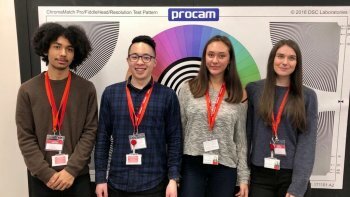 Alongside the BBC, Procam TV is one of our patron supporters, training the camera and sound trainees and offering all the necessary kit for production. We couldn't have done it without them! In preparation for the production, the trainees will meet compliance, music and the legal team at Sky and will learn how to pitch ideas for What's Up TV from our in-house producers. 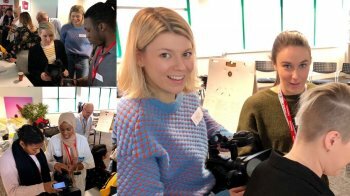 And last, but not least, we thank all the volunteers helping us organise our programmes and to all industry supporters giving back to the new generation of programme-makers. We wish all trainees good luck during the 14 weeks of production boot camp.